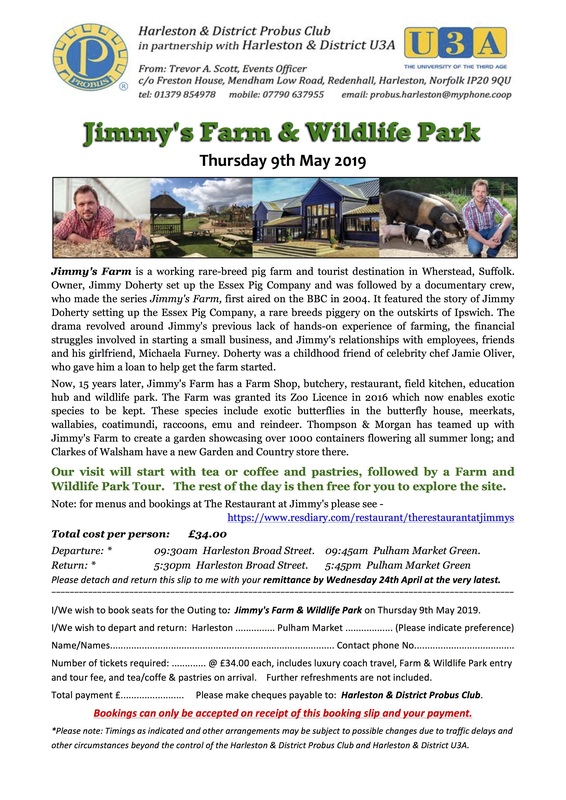 Jimmy's Farm is a working rare-breed pig farm and tourist destination in Wherstead, Suffolk. Owner, Jimmy Doherty set up the Essex Pig Company and was followed by a documentary crew, who made the series Jimmy's Farm, first aired on the BBC in 2004. It featured the story of Jimmy Doherty setting up the Essex Pig Company, a rare breeds piggery on the outskirts of Ipswich. The drama revolved around Jimmy's previous lack of hands-on experience of farming, the financial struggles involved in starting a small business, and Jimmy's relationships with employees, friends and his girlfriend, Michaela Furney. Doherty was a childhood friend of celebrity chef Jamie Oliver, who gave him a loan to help get the farm started. Now, 15 years later, Jimmy's Farm has a Farm Shop, butchery, restaurant, field kitchen, education hub and wildlife park. The Farm was granted its Zoo Licence in 2016 which now enables exotic species to be kept. These species include exotic butterflies in the butterfly house, meerkats, wallabies, coatimundi, raccoons, emu and reindeer. Thompson & Morgan has teamed up with Jimmy's Farm to create a garden showcasing over 1000 containers flowering all summer long; and Clarkes of Walsham have a new Garden and Country store there. Thursday, 11th July Banham Zoo. Kenninghall Road, Banham, Norfolk. Banham Zoo is an award winning family attraction and one of the most exciting wildlife attractions in the country, with over 2,000 animals from around the world and set in 50 acres of beautiful parkland and gardens. The Zoo welcomed its first guests in 1968 and was opened by Martin Goymour who is the third generation of a well-respected Norfolk family. Banham Zoo, along with its sister park, Africa Alive! near Lowestoft, Suffolk, is now part of the Zoological Society of East Anglia and a registered charity. This has enabled the parks to secure their long term futures, with the primary aims of the advancement of education, zoology, animal welfare, environmental protection and to continue with the important work undertaken for wildlife conservation across the world. The ultimate beneficiaries of all that they do, with your support, are the animals in their care and wildlife conservation. Thursday 12th September The English Whisky Co. St. George's Distillery, Roudham, Norfolk. The St George's Tour includes coffee or tea whilst you wait for the tour to start. A guide will then take you onto the distilling floor and explain how whisky is made. You then move onto Warehouse 1 to see the whisky in casks, and to breathe in the amazing aroma caused by the Angels Share escaping before finally finishing with a taste of one or two of our wonderful malt whiskies. Afterwards, enjoy some of the most beautiful scenery in Norfolk. The distillery sits amongst a grove of cricket bat willows which run down to the gently flowing river Thet. There is also set in the grounds, The Kitchen at St George's, a relaxing and comfortable café environment for you to enjoy breakfast, brunch, lunch or simply coffee and cake.